Every summer it happens: I go crazy. Fruit crazy. Symptoms of Summer Fruit Crazy include: buying more summer fruit than could possibly be eaten in one week on a weekly basis, covering the kitchen counter with ripening peaches, plums, apricots and nectarines, obsessively squeezing said fruit to check for optimum ripeness, and eating perfectly ripe fruit over the sink, with much juice-dripping and happy sighing, as many times as humanly possible over the course of the summer. Oh, and constantly battling fruit flies*. What happens when my weekly haul exceeds even the limits of my fruit-crazed consumption? I preserve it in small amounts, so I can keep it at peak flavor for a little longer. Baking apricots turns them soft and jammy while keeping their shape intact, so you end up without bright orange discs of sweet, tangy fruit. Filling the hollow cups of each apricot half with a little honey draws out the juices, so as an added bonus, you end up with a honeyed golden apricot syrup that you can drizzle over yogurt or mix into soda water or transfer to an IV bag for immediate intravenous delivery of summer fruit deliciousness. Best of all? No fruit flies in the fridge. * This simple trick really works for getting rid of fruit flies. To keep them from coming back, make sure to clean up any juice drips and toss overripe or moldy fruit. Preheat the oven to 350°F. Cut each apricot in half and remove the pit. Arrange cut side up in a baking dish, cake pan and pie dish. Evenly drizzle the honey over the apricots, filling the hollow of each half. Sprinkle with a pinch of salt. Bake for 15 minutes. Using a fork, flip each half cut side down, being careful not to splash yourself with the hot syrup inside the hollows. Bake for another 5-10 minutes, until the apricots are soft to the touch and slightly wrinkled, but have not yet totally collapsed. Let cool and transfer to a jar or other covered container. Apricots will keep for one week in the refrigerator. 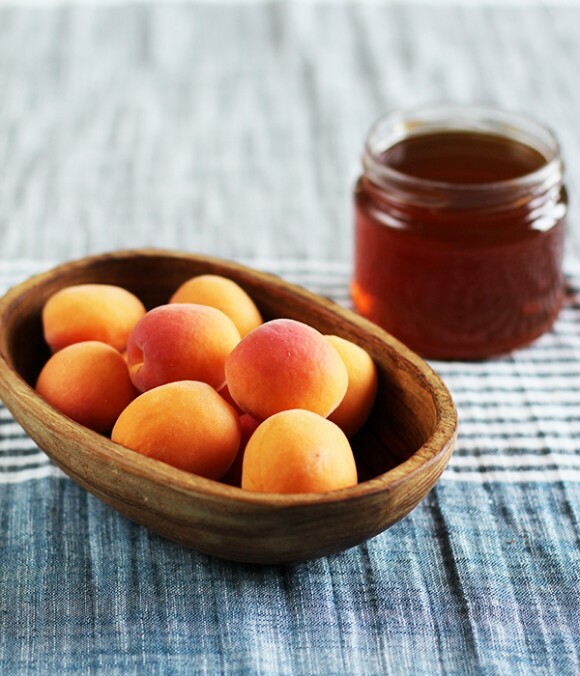 • If your apricots are very soft and ripe, start checking for doneness earlier. If they are a little underripe or on the larger side, they may need to bake longer. 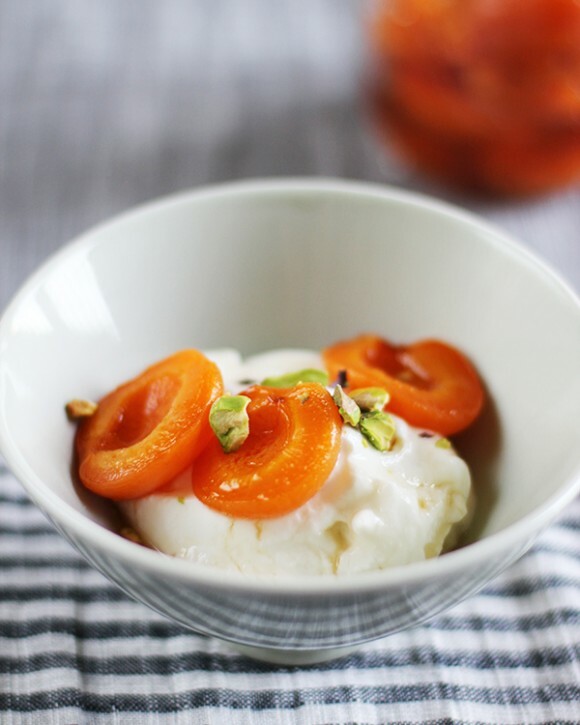 • Enjoy the baked apricots and their syrup on top of yogurt, ice cream or cottage cheese, mixed into oatmeal, muddled in cocktails (or mocktails), spooned over cake or biscuits, or smooshed on toast with nut butter or cream cheese. Just made these (and threw in some peaches as well) – came out delicious! I had some hot just out of the oven – saving the rest in a jar for later. Thank you! So glad you like the recipe — thanks for the quick feedback! This is just *so* beautiful! Had to drop in to say hello :). Happy to have discovered your blog. Those apricots look beautiful! The first pastry kitchen I worked in featured apricots roasted in vanilla sugar alongside an almond olive oil cake…it’s an easy, almost non-recipe that I repeat all summer long with apricots and plums. But, I like the idea of honey & salt even more. And the fruit fly trick? We live by it. A bracing blend of cider vinegar and lemon verbena dish soap is the closest thing I have to a signature fragrance. Thanks for sharing. Love your description of summer fruit addiction. My bench looks exactly as you describe, groaning with tree ripened plums apricots and nectarines. 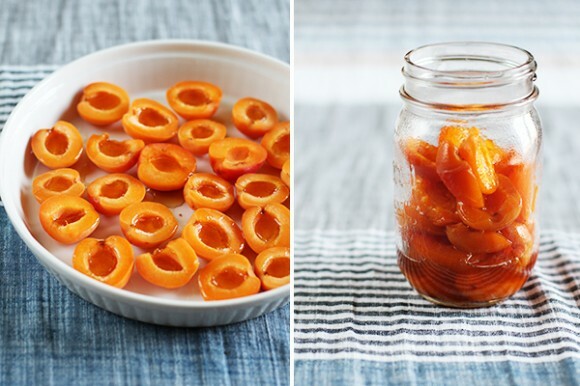 Roasted apricots sound like a heavenly way of using some. Have you ever tied freezing them? I have free flow frozen apricots in the past, but they tend to oxidise. 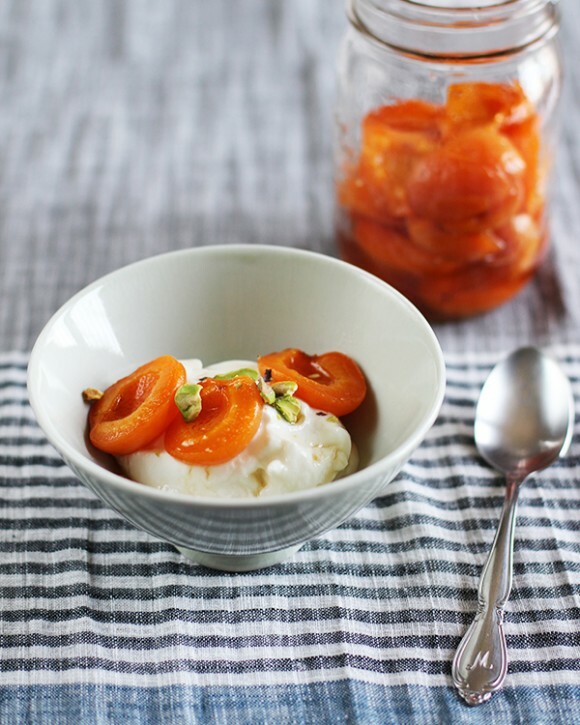 I was looking for a way of cooking and freezing apricots that holds that wonderful summer flavour.